The summer of 1960 didn’t just create the European Championships but also the most consistent team of that decade or any other, as their record illustrates. Over five successive tournaments, the USSR won one, reached another final and two semi-finals as well as a quarter. In their only title victory, that opening Nations Cup, Victor Ponedelnik scored the winner in the 113th minute of the 1960 Paris final against Yugoslavia. That same striker, however, would also reveal the tensions which might have denied the side an even greater record. For a start, a dubious imprisonment had robbed them of their greatest player Eduard Streltsov for the majority of the decade. Secondly, Ponedelnik once revealed the atmosphere was so anxious within the squad that, during the 1962 World Cup, both he and a teammate had lain awake all night unable to utter a single word to each other. Recently, however, Ponedelnik was more forthcoming about that summer’s quarter-final failure to hosts Chile. That’s perhaps open to question. But this team’s pedigree never is. Because of the context and the quality of the opposition, the shock World Cup winners of 1954 will always resonate for reasons far beyond their record. But, in pure football terms, was the ‘Miracle of Berne’ actually that miraculous? Sure, Hungary had trounced West Germany 8-3 just weeks before they met in the 1954 final. But the number of Magyars’ goals was matched by the amount of players that manager Sepp Herberger rested for what he saw as the true crunch game against Turkey. West Germany won that 7-2. And, yes, the nuances of knock-out football probably meant the world’s best team weren’t crowned champions in Switzerland. But, two weeks before the tournament, Herberger made his team watch Hungary’s famous 6-3 win at Wembley twice. The first time, his players were awe-struck. But, the second time, they were intrigued. Once the wonder of Hungary’s attack had ceased being so novel, a number of errors and flaws became apparent. And, in the 1954 showpiece, West Germany aggressively exploited them. For that and the manner in which they raised their game, Herberger’s side were far from unworthy winners. The fact that initial group-stage defeat to Hungary was their first in a year and that the core of that team got to the semi-finals in 1958 are emphatic evidence of that. Because of that attitude, which summed up so many unsavoury incidents, this West German team became one of the most unloved. But it was also one of the most unflinching. For a start, in players like Bernd Schuster, Uli Stielike, Manny Kaltz, Felix Magath and Karl-Heinz Rumenigge they had an underappreciated quality. And they all ensured that the side went over a year without defeat in the build-up to the Euro 80 victory. Only Italy’s emotion prevented a rare double in the 1982 World Cup final. You can forever argue about their attitude. But not their achievements. A betting scandal. Three dire opening draws. Utter public dissatisfaction. A barrage of criticism. Diego Maradona. And a Brazil many saw as champions-in-waiting. Italy overcame all of that for the most cathartic World Cup win of all. 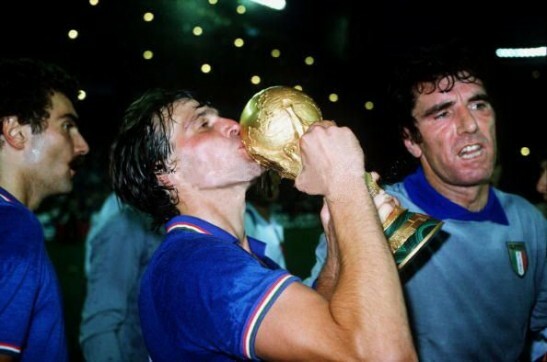 Most famously, the resurgence was personified by Paolo Rossi and encapsulated in the brilliant 3-2 win over Brazil. In that match, the striker put two years of misery behind him to finally click and claim the hat-trick that sent Italy on their way. An otherwise patchy record of 12 wins from 26 perhaps proved some critics right. But those last three games of the 1982 World Cup as well as a respectable Euro 80 indicate that this Italy had resilience when it mattered most. In a formative age for the game during which European countries were reluctant to travel and many international competitions were far from complete, a small country were perhaps fortunate to be so ahead in development. But there was no denying Uruguay’s superiority. In the end, they confirmed their quality by beating the team that had most recently conquered South America. Uruguay overcame Argentina 4-2 in extra-time to win the first ever World Cup and proclaim themselves pioneers.